“Until death do us part.” This is the usual watchword the priests and pastors urge upon the couple at the marriage ceremonies. As a traditional uttering at these revelries, anyway. So you stick with the other part of the uttering, pilule “For better, for worse.” Probably in all cases, they think of the “better”; and never imagine of the “worse”. I cannot claim to be any different! Twenty-one years ago, at the height of the Bosnian crisis, Newsweek magazine carried an extraordinarily distressing (arresting) picture of a young couple. It gave the story that, in the ethnic cleansing conflict in the-then Yugoslavia, gunmen had shot the girl. And rather than try to save himself, the weeping boy hunkered down over the body of his girl friend; and he too was shot dead – in that posture. The killers casually walked away, leaving the emotional crouching still scene. It was a gesture of mutual death. God must have put together something astonishing concerning a deep relationship for a human being to latch into. This is one of the early things to flash in my mind when Totio died three minutes to one o’clock on the morning of November 11, last month. Our children named my wife, Mary Margaret Omoding, nee Abuin, Totio, as a playful nickname using the name Toto (Mama), as all Iteso children call their mothers. I adopted this moniker, too, and so did most of our relatives. Despite the fact that she had been laid up immobile in bed close to five years as an invalid, her demise is a shattering event for me. I had got used to nursing her with the help of whichever relative I had got to helping me. An attack of arthritis had led her to be bunched up of her limbs, both hands and legs. All my attempts at prayer; and various types of medication over the years, came to naught that night, following my getting a therapist from the Wandegeya chemotherapeutic laboratory. Even when eventually her limbs had been somewhat straightened, Totio succumbed to the pain caused in the exercise. A doctor friend said she had died of a heart attack following the pain. However much friends and relatives have tried to assuage the pain, it does not go away. It starts as a gut feeling from deep in the solar plexus welling upwards to the mouth and eventually to the eyes. It is difficult to keep away the tears – and the memories. 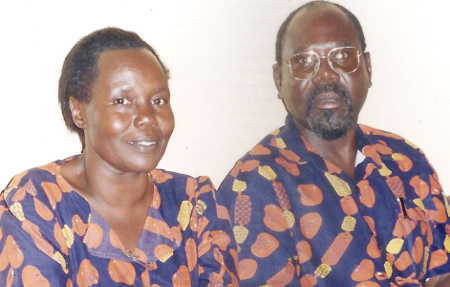 We met in 1958 in Usuk Primary School, in present-day Katakwi District. Totio’s father was a teacher in the boys’ primary school which I attended. I was staying with my aunt and guardian in the adjoining girls’ primary school in the Usuk Catholic Mission. The girls’ dormitory, where Totio and the other girls were sleeping, was not very far from the house where the female teachers were occupying in which I stayed with my aunt. The enduring memory Totio and I used to regale to each other with over the years was one in which on some Saturdays we used to dance rumba and cha cha dance steps to the music of the Decca and ASL records labels of those days. It was played on the grammaphone records of the business label, “His Masters Voice”. We were then 10 years of age. For the next 55 years, with little breaks, punctuated by each of us going to the respective schools, we have been together. Until now it was always for the better, though in the intervening years there were periods of “worse”. And then, you gave, your love to me. The Lord has given; and the Lord has taken away. Praise be the name of the Lord. It is not any comfort to any modicum of faith I may have. I do not know what else to say. Is Uganda’s economy moving in the right direction?